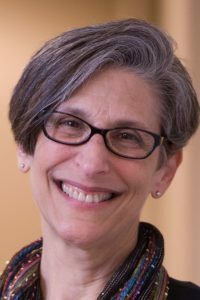 Rabbi JoHanna Potts is currently serving Temple Shalom as the Interim Director of Education, coordinating the efforts of Education team leaders and acting as the liaison from the Religious School to the Temple Shalom senior staff, Board of Trustees and community-based religious education organizations. Rabbi Potts has been involved in teaching and leading Torah Study at Temple Shalom for the past 24 years. This is Rabbi Potts’ third time holding the role of the Temple Shalom religious director. She brings a vast array of experiences in educational leadership to the temple including Director of Student Affairs at Washington University in St. Louis, Director of Sports Information at Grinnell College, and camp director in Green Bay, WI. She is also co-rabbi at the Jewish Studio, an independent programming group for “boomers”. Rabbi Potts has an independent consulting practice working with small non-profits focusing on change leadership and offers online professional development classes for Jewish educators. As the COO and Executive Director at the Partnership for Jewish Life and Learning, she led the congregational education change initiative in the community. Prior to her current roles, Rabbi Potts was the Director of Education at Temple Solel, the first Director of The Primary School at Washington Hebrew Congregation, the first Director of the Middle School at Gesher Jewish Day School in the Washington, D.C. area, and a founding parent of Jewish Primary Day School. She also served as the co-chair of the Conference for Alternatives in Jewish Education at Duke University and is a board member of NewCAJE. Her dual passions are strengthening communities by making them more inclusive and bringing greater enjoyment to Jewish learning with a view toward empowering individuals to create lives of meaning through Judaism.